Frescobaldi’s legacy was extensive. Johann Jakob Froberger journeyed to Rome to study with him, and in his turn Froberger influenced Johann Sebastian Bach. 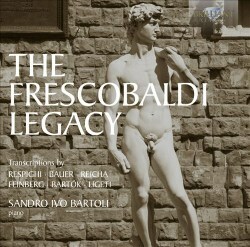 Later generations discovered Frescobaldi’s music in diverse ways. Antonín Reicha, for instance, discovered him as part of a current of Classical thinking about the past and about fugal development in particular. Hence Reicha’s Fuga Fantasia, published privately in 1805, is a Frescobaldian homage, based on the Recercar Chromaticho from Fiori Musicali. It wears its hymnal quality strongly, Reicha taking the time nonetheless to explore curious intervals in a mildly exploratory way. It was generations later than Reicha that most fully explored the legacy that Frescobaldi had left. They were led by Respighi who delivered his transcriptions to his publisher Ricordi in 1917, the firm having the previous year asked him for a series of transcriptions. They had themselves been inspired by the pioneering edition issued by publishers Torchi. Respighi decided to couple the Preludes with toccatas published in the Torchi edition of Frescobaldi’s works, which meant that he was unknowingly infusing toccatas actually written by JS Bach’s contemporary Gottlieb Muffat. The German composer had written them as substitutes for the originals and it was only in 1920 that the deception was uncovered. In the case of the three pieces performed in this disc by Sandro Ivo Bartoli, we are introduced to some fine transcriptive work, brought to life via rich chording and a significant use of the pedal. The A minor Toccata in particular unfolds with quiet dignity, very different from the corresponding Prelude in G minor. Perhaps the most long-lived of Respighi’s piano transcriptions though is the Passacaglia, much favoured by Horszowski, who played it often during his very long life. It is, in effect, a grand free fantasia and it can’t escape notice that Busoni stands in the background with his transcription of Bach’s Chaconne. There are smaller works contributed by executant/composer/editors. One such was British pianist Harold Bauer, whose Capriccio on the Cuckoo’s Call was similarly inspired by a published, in Bauer’s case the Boston Music Company in 1918, the year after Respighi’s work was published. Bauer doubtless had an ear cocked to Busoni’s experiments in this area too. Bauer’s pleasingly simplified effort sounds delightful still, though sadly he didn’t record it. Samuil Feinberg was, like Bauer, a pianist and composer and transcriber. His brief Canzona and Capriccio pastorale are simple but telling examples of his refined art. Bartók’s Toccata and Fugue derive from the Torchi edition that Respighi used: thus the Toccata is from Frescobaldi’s The Second Book of Toccatas, 1637 and the Fugue is by Muffat. Bartók instigated a full programme of Busonisation in the Toccata altogether delivering the pianistic toward the realm of the organ loft in no uncertain terms. Whilst Bartoli is efficient here, he lacks the graphic adrenalin and dramatic clarity imparted by one of Bartók’s greatest interpreters, György Sándor, whose Vox recording [MC128] is pitched at an altogether more elevated vantage. I should add that Sándor didn’t record the Fugue. To bring things very much more up-to-date Ligeti’s Ricerare, fully revealing his youthful contrapuntal mastery. So this is an interesting panorama of Frescobaldian influence through the centuries. The church acoustic is very attractive and the booklet is helpful. Sometimes, as in the Bartók transcriptions, Bartoli lacks kinetic fire but elsewhere he is an adept guide.